It’s never too late to start thinking about summer camp. Here at Prosperity Day School, our summer camps are full of learning and play. At PDS, summer camps start in June for children age five to 11. Kids will be constantly engaged with weekly programs, games, arts & crafts, field trips, in-house activities, and much more! Prosperity will provide breakfast, lunch, and snacks every day for every camper. If you’re looking for a fun, engaging experience for your children this summer, then the summer camps at Prosperity Day School are perfect for your family. Space is limited though, so make sure you register early! Summer tee shirts are $12.00, and kids must wear summer tees while they’re at PDS. Here at Prosperity Day School, we’re highly committed to helping kids learn and grow while also having fun. Your children will create meaningful, lasting relationships with other campers and will have a blast every day they come in. With activities that change every week, no camper will get bored at a Prosperity Day School summer camp. Sign up for our summer camp today and your kids are sure to have a summer filled with fun and adventure. 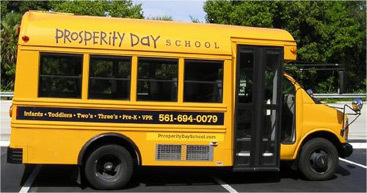 Contact Prosperity Day School today to sign up for the best summer camp in Palm Beach Gardens.